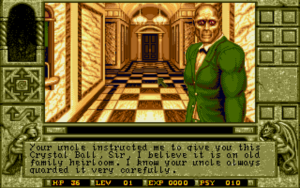 WHOOOO Spooky times are coming and what better way to kick off the haunting season than with Horrorsoft’s Amiga classic: Waxworks. Well old Uncle Boris has done it again YEP, that’s right! He’s only gone and died, And now its up to you too free your family from a curse that has shadowed you and your ancestors for centuries. Its the same old story we’ve herd for years now. Boy meets girl, girl is a witch and curses family with a bunch of evil twins, and Uncle makes a magical waxwork museum that transports you to other times too kill a bunch of evil relatives. *Yawn* yeah whats on the other channel. Of course I’m being sarcastic. This story is rather in-depth and so is the game so come with me now on a terrifying journey through: Ancient pyramids, mine shafts and the misty streets of London complete with Prostitutes (that’s just London not every level). 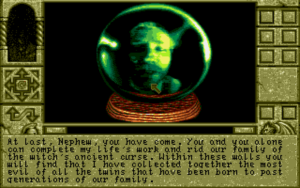 Created in 1992 by Horrrorsoft and published by Accolade for the Amiga and MS-DOS, Waxworks is a dungeon crawler/horror hybrid complete with RPG elements. The story is long so requires the manual and for you to actually read it!, which luckily it is available on the web. The game itself come on 10 YES 10 floppy disks, so ready your floppy changing hand because you will need it. Well it turns out that your uncle is a wizard, bad stuff happened to your family and to free the curse of Ixona you have to go through his mystical magical mannequin funhouse of horrors. To help you on your journey the butler (who looks stacked BTW! I mean look at that suit, if he flexed…. good God) will let you into the exhibits and hands you a crystal ball containing the floating head of your recently deceased uncle. Spooky places these pointy tombs and full of Crazed Eunuchs and Knife-wielding guards. Descend dirty dreadful shafts of doom and encounter a hoard of genetically mutated ex-members of the town above . Take a run through the misty streets of London and chase down the infamous Jack the Ripper. Only problem is the police are out in force and they think it’s you! And finally we have a graveyard level complete with dead guys jumping out of the soil. Good fun to chop off all their bits though, nice touch. Each level is different keeping the gameplay fresh. 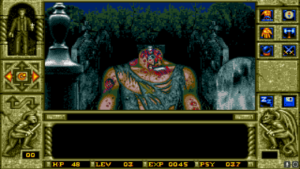 For example the pyramid is a typical hack-n-slash dungeon crawler in the vein of Eye of the beholder, but the London level requires almost no fighting at all bar a showdown with Jack himself. Instead requires you to gather clues and talk to the ladies of the night to discover the whereabouts of Jack all the while being hounded by police. The artwork on display here is great. 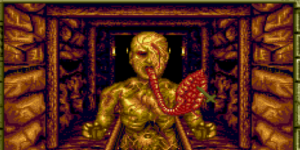 Imaginative level design, cool looking enemy’s and disgusting pictures of peoples’ insides make a very scary looking game. If I had played this as a child I would have been disturbed. Even as an adult I was still pretty shocked to see the death images. Overall i really like the art style and it sets a great mood, Visually its on par for games of its time like Eye of the beholder 2, and comes across a more adult game with a highly polished UI (user interface). If you have played a dungeon crawler of the time, you know what to expect. If you haven’t, you are in for a shock. There are 2 main control methods: Keyboard which just requires you to use the arrows to move then click things in the UI or the game screen (my preferred method) or Mouse where you control the character by sticking the edge of the screen that you want to travel to. I find the latter a bit sticky and not as intuitive as it was in the Eye of the beholder. The UI is simple and easy to understand, and being able to contact uncle Boris for tips is a great way to coach you though the levels which are very large (especially in the case of the pyramid and the mine shaft). Make sure to get your pen and paper out because maps are necessary. Music in the game is good for the most part. The different styles of music fit your surroundings well, which effectively create an air of tension and mystery. However, as previously mentioned, the levels are long. I only spent 25-30 minuets on each level, and after 15 minuets the music starts to grate on me. So to summarise: sound yeah good but listen to spooky YouTube ambience when you sit down for a long run on this. Yes I’m alive. Are you ? 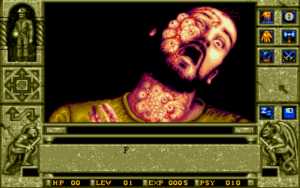 I know the game is a classic with those who played it back in the day and anyone who is either: an Amiga fan, Dos fan, into horror games or even dungeon crawlers should play Waxwork. However it’s not all smelling of roses; there is a rotting corpse here to address. Now I’m not sure if I’m lazy or have just grown to appreciate the finer things in life but swapping 10 disks while playing the game is silly. On DOS I imagine you can install the game and maybe you can on Amiga, but it certainly didn’t give me the option. At times it was accessing the disk drive and reading info every single step I took causing a halt for a good 3-6 seconds which was unbearable. Do not despair though as there is a WHDload version out there for those who have the know-how to work it. 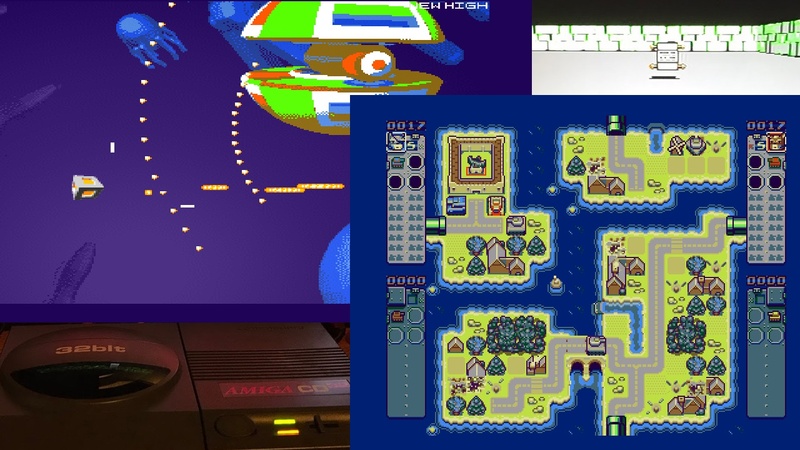 That’s the version I used on my 1200, but to get these lovely screenshots I had to emulate with the 10 floppy’s which is too much. Overall Yeah great game. Too many disks, but then you can always install it to HDD with WHDload, Lovely graphics, good story and freaky goings on. Got a game you would like to see reviewed ?